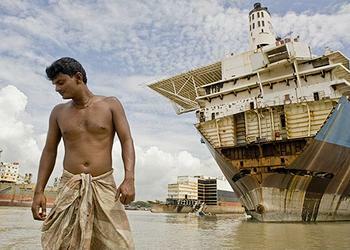 LONDON, UK, April 11, 2014 (ENS) – ​The International Maritime Organization and the Government of Bangladesh today agreed to improve safety and environmental standards in the country’s ship-recycling industry through cooperative efforts over the next 18 months. A Memorandum of Understanding formalizing the cooperation between the two parties was signed by Nicolaos Charalambous, director, Technical Cooperation Division, IMO and Ashadul Islam, additional secretary, Economic Relations Division of the Ministry of Finance of the Government of Bangladesh. IMO and Bangladesh will jointly implement a project entitled Safe and Environmentally Sound Ship Recycling in Bangladesh – Phase I. The most recent deaths occured on April 3, when four shipbreaking workers were killed and another three were critically injured when a gas cylinder exploded in a shipbreaking yard in Chittagong, Bangladesh. 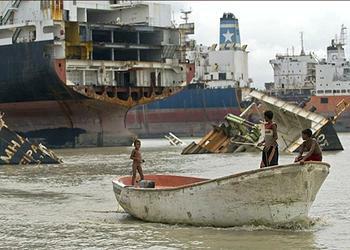 Yet, the IMO, the Government of Bangladesh, the Norwegian Agency for Development Cooperation, and the Secretariat of the Basel, Rotterdam and Stockholm Conventions have been working towards the establishment of the Safe and Environmentally Sound Ship Recycling in Bangladesh project for years. The Bangladeshi ministry will coordinate input from the different stakeholder ministries within the country, while IMO will also collaborate with other relevant UN agencies including the International Labour Organization and the United Nations Industrial Development Organization to ensure successful delivery of the project. the Stockholm Convention on Persistent Organic Pollutants, 2001.